Pikes Peak’s backcountry abounded in beaver a hundred years ago. Even today, the streams are choked with the well-engineered dams of these industrious animals. Their luxuriant pelts could make a hard working trapper rich, selling for about $6 each. Trappers generally set about six to twelve traps each day, and harvested an equal number of pelts. Florissant was a favorite trapping area for Kit Carson and his band of independent trappers during the 1840s and the early 1850s. The mountain man era started with western fur traders after the Lewis and Clark Expedition. If not for the vision of Thomas Jefferson to purchase “Louisiana” and points west, our world would be much different today. He bought 1 million acres from France for $15 million. Lewis and Clark were one of the few co-commanders that were successful in their journeys in this marvelous land. The Spanish sent out 3 expeditions to stop and kill Lewis and Clark, but they did not go far enough north. Some friendly Indians (probably Shoshone and Nez Perce) gave Lewis and Clark horses, which helped them survive their journey. Beavers were found all over the world, but by 1600 there was not enough supply for the demand, except in Russia. They mostly made top hats with beaver then, and they have been around since the 5th century, because beaver felt has hooks to hold it together. Even today’s hats have some beaver felt in them. Beaver was hunted most heavily in the US from 1806-1845. At that time the Chinese invented silk hats, from the silk worm, so beaver hats lost popularity. There were never more than 500 mountain men at any one time. Most were Scots or Irish with a few Germans, and Spaniards. John Jacob Aster organized the first big expeditions to go to the northwest to hunt for beaver and formed military brigades and military camps. Then they organized in Santa Fe. Kit Carson, mountain man, was the only non-president to have a state capitol named after him, Carson City NV. John Charles Fremont led several expeditions. Kit Carson was very popular with the Ute Indians and had a Ute wife. He and chief Ouray became good friends, and he was a great leader despite being only 5’5’’ tall. Legend has it that he and his partner watched the Utes fight the Comanches at Fortification hill. John Fremont was also about that height. The Navajo Indians did not like Kit Carson. Around 1840 the mountain men started fading out, but then they led explorations all over the western US, and later led pioneers out west in wagon trains. They also did a lot of mapping. Mountain men told tall tales to pass the time. Trappers would take a stick, tie a long piece of rawhide to it and then put a beaver trap right underneath it. They would take the “scent” from the caster gland of a dead beaver, mix up a concoction of it, and put it on the stick. Beavers are very territorial so they would come over to the stick to try and get rid of it. Then, if the trap sprung on the beaver’s hind leg, the trapper would have a good chance of getting the beaver. If he had his front leg in it, he might chew off his leg to get out. The beaver would hopefully drown trying to escape from the trap. These traps were about 10 pounds. The traps on our museum windowsill are mink traps and are much smaller. Most trappers only had 6-10 traps as this was all they could handle in a day. Trappers only ate about one meal a day, and only when the job was done. This was all done in about 2 months of work. At other times of the year pelts weren’t as nice. The trappers practiced game management trying to take only male beavers. 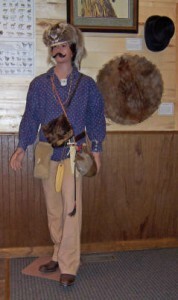 Indians also tried this but also got females and kits by going to the beaver lodge and stabbing the beavers, and this made for unacceptable pelts. Trappers put their pelts on willow sticks forming a pleu (the rounded fur/on the stick at the museum.) At first trappers had to bring their pleus to St. Louis. Late on they brought them to the rendezvous, where there was lots of liquor and gambling. Some trappers would skip this and sell them to someone else so they weren’t tempted. Whiskey and tobacco were important trade items, and gunsmiths and black smiths were also there. There were 10 times more Indians than trappers at the rendezvous. A beaver pelt was worth about $8. He wanted to get about 100 pleus, and put 50 in a pack on each side of a mule/horse. Every trapper put his mark on a pleu so no one could steal it. For a beaver hat, a person would strip the fur, and make the hat. A beaver top hat cost about $30, a goodly sum in the early 1800’s. The mountain man ate the beaver, and the tail provided about 2 pounds of very nutritious meat. The mountain men used buffalo robes for warmth, and bedding, and buffalo bones later on for fertilizer. They would not usually make a shelter, unless it was a 3-sided structure made of pine boughs. The buffalo robes were very warm however. Mountain men/trappers were always on the lookout for Indians. They usually did not wear beards, only tiny mustaches, because the Indians did not like people with much facial hair. Indians don’t generally have facial hair and they did not trust those with beards, calling them dogface. Also, Indians did not think it was a crime to steal horses, so a trapper had to keep a close eye on his horse. And, finally, the Indians did not like the trappers taking their beaver away from them. Because of the Indian danger, a lot of trappers traveled in groups, to increase their chances of survival. Trappers generally did not have cabins. They were called “fiddle-footed” meaning always on the go, another way to survive the elements and the Indians. However some trappers were felled by unexpected spring storms. The mountains Indians like the Utes were generally more friendly than the Plains Indians like the Blackfeet. Mountain Indians were the Utes, Shoshone, Nez Perce, and maybe the Apache. Gorgeous George- dressed in a fine badger cap with a bill. In his “possibles” pouch there is a deer antler powder measure and steel for making a fire with flint. It was called a “possibles” pouch because you would fit everything possible in it. Rawhide canteen PROBABLY would not be used, because water would taste terrible, once it mingled with the rawhide, and water was quite plentiful in our area. “Fly swatter” was probably just something decorative. The best canteens were made out of gourds. The waxed mustache should maybe be replaced with a smaller pencil type mustache. Water from the streams had giardia in it, but most mountain men were immune to that. The medicine pouch had mostly amulets, sweet grass and herbs in it. Leggins were made of deer hide. Usually the mountain man carried a tomahawk in the back of his costume. The bullet pouch was made out of rawhide. Mountain men either had a musket or a rifle, and the smaller barrels were a lot more useful than the longer ones, particularly when the Indians attacked. The two most important things in a trapper’s life were 1. his horse and 2. his rifle. The bullets were usually 50 caliber and up. (1/2 inch).